Ch 9383 was the 6th SA Speed Twenty built of the pre-production batch of 26 cars with the early ‘flat’ radiator. It was the third Cross & Ellis bodied car, one of two supplied to Galts of Glasgow. It was finished in red with black wings and wheels, brown leather and supplied with a bonnet strap, twin spare wheels and chromium plated lamps. This photo was taken in London W8 in July 1963. This car was so early in the production batch that it was not then even known as a ‘Speed Twenty’, being referred to in Light Car report as a “Low-chassis Silver Eagle sports”. The works press car/demonstrator was even photographed fitted with a Silver Eagle badge on the headlamp cross bar. Ch 9383 was destined for a long sporting career. 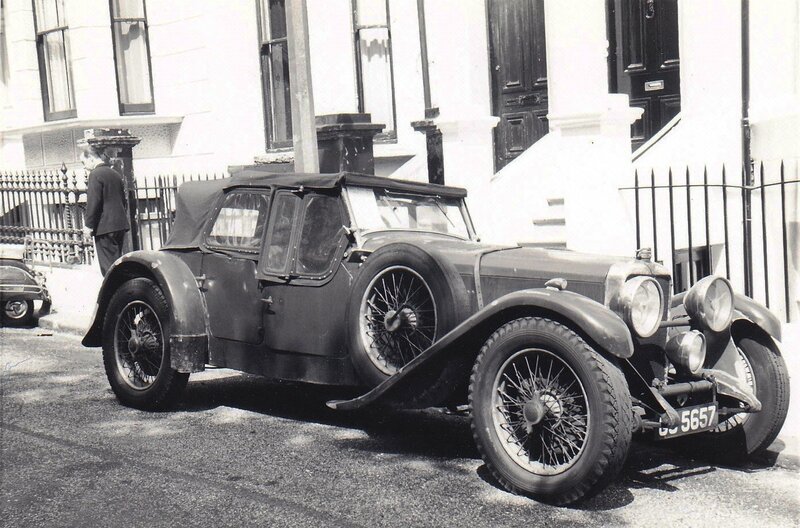 The first owner was Ian Fraser-Marshall, a keen motorist from Kilbarchan, Renfrewshire, who participated with the car in the 1932 and 1933 RAC Rallies. We don’t know how long Mr Fraser-Marshall kept Ch 9383 but by 1939 it was in the ownership of a Mr Cillewell in Dorset. He competed in events run by the West Hants & Dorset Car Club, winning their ‘Moonfleet Rally’ outright in the early 1950’s. The family also used the car for holiday trips including towing a caravan with it to Scotland, something you don’t see many SP 20s doing today. In the early 60s the car passed through a number of hands before AOC member Michael O’Callaghan of Stevenage bought and rebuilt it. He discovered the car had been accident damaged in the rear and fitted a replacement chassis from a VDP coupe he had acquired for parts. Ch 9383 was painted green at that time but on removing the paint he found the original red and black finish, so he restored the car with these colours. He sent the car to a Bonhams auction in 1996 and its present whereabouts are unknown. Nick Georgano’s photo, taken in the early 60s shows it looking rather down-at-heel, probably in the green paint before the rebuild. The sporting background of the car is indicated by the still-extant bonnet strap and quick-release radiator filler cap. The radiator appears to have been ‘botched’ with a film block let into the original casing. These flat radiators were constructed with the honeycomb block soldered directly into the chromium plated case, in the same fashion as vintage Alvis cars. Reg. GG 5657.